In Ancient Rome, Friday was execution day. In Britain it was Hanging Day. From the bible Friday is said to be the day Eve gave Adam the apple and were expelled from the Garden of Eden, it is also the day that they died. The great flood happened on Friday, the Temple of Solomon was destroyed on Friday and Christ was crucified and died on Friday. Witches prefer Friday for coven gatherings. If Friday was a holy day for "heathens" the Church felt it should not be for Christians, so Friday became known as the "Witches' Sabbath." The name Friday is derived from the Norse goddess known either as Frigg - wife of Odin (the goddess of marriage & fertility, the moon & witches) or Freyja (goddess of love, beauty, sensuality, war, good fortune, magic & wisdom). Pre-Christian Teutonic people actually considered Friday to be lucky, particularly for wedding, because of its association with these goddesses. This however changed when the Christian church came into ascendancy. Frigg/Freyja was re-cast in folklore as a witch and her day became associated with evil doings. As legend goes, the witches of the north used to observe their Sabbath by gathering in a cemetery in the dark of the moon. On one such occasion Freyja came down from the mountaintops where she lived, and appeared before such a group of 12 witches. She gave them one of her cats and ever since then the witches' coven, and every properly-formed coven, is comprised of thirteen members. Other superstitions concerning Friday include: Clothing made on a Friday will never fit properly. Visiting your doctor on Friday will not have a good result. Never change your bed on a Friday, as it will result in nightmares and bad dreams. One should not move their residence or marry on a Friday, if they expect any good to come of it. Cut your nails of Friday and you cut them for sorrow. Friday is an inauspicious day to start a trip as "misfortune will follow." Ships that set sail on Friday will have bad luck. The suspicious number 13 and the misfortune it is associated with are known more or less planet wide. There are so many people with a fear of the number thirteen, and they will go to great lengths to avoid it entirely. This is why there are cities that do not have a thirteenth Street or Avenue, highways often do not have a thirteenth exit, many airports do not have a thirteenth gate and many buildings do not have rooms and in some cases floors number thirteen. One of the most commonly known and observed superstitions concerning the number thirteen, has to do with dining. It is said to be incredibly unlucky to be invited to dinner and have thirteen people at table. The belief is that the first person to rise from table and/or the last person to sit down at the table are destined to die within the calendar year. The only way to avoid this is for everyone to be seated and to rise from the table at the same time. There is some hope for everyone's survival if two or more of the people at dinner are seated at another/separate table. According to the bible, at the Last Supper Judas Iscariot was the last person to take a seat at the table. Interestingly enough, precisely the same superstition has been attributed to the ancient Vikings. As one story goes, twelve gods were invited to a banquet at Valhalla. Loki, (god of mischief) had been left off the guest list but crashed the party, bringing the total number of attendees to thirteen. True to character, Loki incited Hod (the blind god of darkness and winter) into attacking Balder the Good (fairest of the gods). Hod took a spear of mistletoe offered by Loki and shot it at Balder, killing him instantly. This tale apparently explains why the Norwegians still believe that thirteen people at a dinner party is just plain bad luck. It is said that if you have thirteen letters in your name you will have the "Devil's luck." There may be some truth in that as Jack the Ripper, Charles Manson, Jeffrey Dahmer, Theodore Bundy and Albert De Salvo all had thirteen letters in their names. Here are some more interesting facta about the number thirteen: There are thirteen steps leading to the gallows. There are thirteen knots in a hangman's noose. It is thirteen feet the blade of a guillotine falls. Lizzy Borden was said to have spoken only thirteen words at her trial. The thirteenth card in a Tarot deck is "Death" often pictured as the Grim Reaper (a skeleton, often in a hooded cape, carrying a scythe). It should be noted however, that the Death card is rarely if ever read as "death" but as transition, change or new beginnings. The driver of Princess Diana's vehicle hit pillar #13 at Place de l'Alma when she was killed in Paris, France. Apollo 13. In 1970, the thirteenth mission was to be launched from pad #39 (13 x 3). The mission was aborted, after an explosion occurred in the fuel cell of their service module. The rocket had left launching pad at 13:13 CST and the date was April 13th. There is evidence to show that although most people will claim not to be superstitious, businesses, worldwide, show a marked decline in sales etc. on Fridays the thirteenth, as many choose to put off business decisions, investments of money, business and personal travel and even personal events such as weddings. Many others choose not to go in to work, eat in restaurants, and go to movies, theatrical performances or to entertain in their homes on that day. 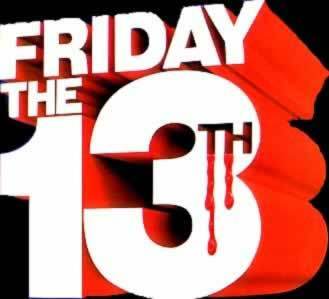 Do you have a theory about Friday the 13th, some scary tale to tell or do you believe like I do that if you go looking for bad luck you most surely will find it. Remember to say, “Thank God it’s Friday” 13 times today and see what happens. Have a great week-end and stay safe. Minnie still needs some help with her Troll so try to stop by and add your twist to the story. I will try to finish it off before Alex Cavanaugh's Cassa storm hits next week. Check out his site for more details! I still say Friday is my favorite day. Friday has always been my preferred day off, and the beginning of the weekend. It's an odd number, people dislike odd numbers, something is always left over. Poor #13. A slew of information with regards to the13th... thanks for sharing! My dear sister was born on the 13th, I met the love of my life on the 13th, I consider it one of my lucky numbers,(anything that adds up to4) and I'm sure other numbers if researched could prove even more morose! We both decided to do the origins of today, Siv. Great minds think alike, right? I learned some new things even so here. CassaStorm hits next week! Thank you for the shout-out for my cover reveal. I love reading about superstitions. That's how I was inspired to write my series about the 13th floor. 13 has always been lucky for me!